ADSThis space is available for public notices and ads. Contact us. MoCreebec has a Economic Development Department is tasked with assisting Chief and Council and community members with projects that relate to Economic Development. It has one employee, Mel Orecklin, Economic Development Officer. A strong self‐reliant Eeyoud living in a prosperous, healthy and sustainable community. Establishing an economic environment that builds our people, community and ventures. negotiating agreements for current resource development opportunities. 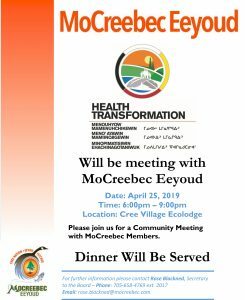 MoCreebec’s most significant economic development is the Cree Village Ecolodge. Our focus is on improving the Ecolodge’s financial performance by reducing expenses and improving occupancy rates. The Manager of the Ecolodge is Todd Haynes who has been hired to mentor Becky Molyneaux, the Assistant Manager. 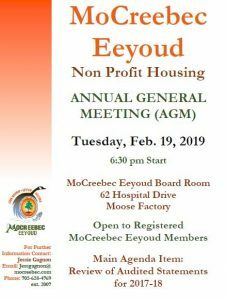 All members are invited to speak with Mel if they have a desire to start a business, are interested in major repairs to their privately-own home or purchasing a home. Mel is an engineer, has an MBA and is a Certified Aboriginal Financial Manager with experience in business and community development and financial analysis.